How do I tell this tale? Words will surely fail even while the richness leaves my jaw-aching from perma-grin. 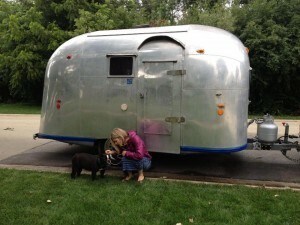 Last Monday morning at 8:45, I bought a 1960 Airstream Pacer. This was not exactly a whim, although it was my first purchase on eBay. Ever. For anyone who knows the rush of a bidding war on eBay, you know what I am talking about. And, factor in that this was a somewhat larger than usual purchase and not simply a pair of shoes or a purse. I say it wasn’t a whim, as over the weekend, David and I attended our first Airstream rally. Having met a whole new group of lovely like-minded people, we joined the club and began to broaden our Airstream horizons. Many of our new club member friends have multiple trailers, which opened our minds to the possibility of more than one.